Tempus Fugit Spirits is dedicated to the glory of the well-made cocktail. The goal is to source and recreate rare spirits and liqueurs from the pages of history to satisfy the demands of the most discerning connoisseur. 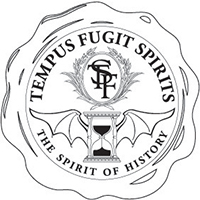 Tempus Fugit Spirits Crème de Menthe is fully distilled from botanicals and is quite unique in its genre. In crossed-referencing manuals in three languages, we discovered that a true historic crème de menthe is quite a complex spirit and cannot be made correctly with just mint alone. After finding a few recipes that remained faithful in these different languages, we assembled the plants and conducted numerous test distillations. The botanicals are macerated and then fully distilled and the finished distillate is reduced with spring water and cane sugar, similar to the Crème de Cacao. While fully distilling botanicals for the Crème de Menthe is costly and the heart of the distillation is quite small in yield, it produces the best results and the most authentic product. Aromatically the mint is bright and dominant, but is balanced and supported by more deeper, savory notes, owing to the unique recipe of many botanicals, which are not just mints alone. It is silky in the mouth, crisp, yet complex, something that definitely cannot be said for today's industrialized crème de menthes. Tempus Fugit Spirits Crème de Noyaux is a classic 19th century French liqueur craft-made by distilling apricot and cherry pit kernels, combined with bitter almonds and other botanicals, creating a complex, nutty, pit fruit-sweet aroma and flavor, with a slight touch of balancing bitterness on the finish. Many years of research and tests were needed to finalize the production techniques and secure local Swiss sources of the natural ingredients indicated in the original protocols. Its garnet-red color comes from the addition of the natural coloring cochineal, following historic directives. We are confident that this liqueur represents the classic, lost Crème de Noyaux, prized by the best bartenders of the Golden Age. It is a perfect addition in many classic cocktails (especially those that call for nut or cherry liqueurs ) as a primary mixing ingredient or equally as versatile in dashes, in the fashion of a cocktail bitters. Fernet del Frate Angelico is truly a step back in time and a major step up in quality from anything available on the modern market. It is made in micro-batches by hand at the Matter Distillery in Switzerland following an original, hand-written recipe, purchased by the distillery's original owner in 1930 from a long-closed Italian distillery. This amazing liqueur can be sipped on its own, but shines in skilfully-made cocktails, especially the Employees Only 'Fernando' and the Toronto. It is a fantastic, multifaceted substitute for cocktail bitters. Tempting to take straight as a shot, stop to savor and enjoy its complexity, and Fernet del Frate Angelico will instantly become your go-to sipper for the first and the last drink of the night. Since its release in 2013, Fernet del Frate Angelico has been recognized by many as the 'ultimate'/'luxury' Fernet, both in the USA and Europe. Gran Classico Bitter is a bitter apéritif liqueur created following the "Italian Bitter of Turin" recipe dating from the 1860s. It was originally produced in Turin, Italy under the name Torino Gran Classico; the recipe had been purchased in 1925 by the small Swiss distillery E. Luginbühl and a version has been produced for mostly local consumption ever since. Gran Classico was developed by reverting back to the original recipe; it is made from a maceration of a mixture of 25 aromatic herbs and roots including wormwood, gentian, bitter orange peel, rhubarb, and hyssop. The maceration also creates a naturally attractive, golden-amber color, and no additional coloring is added. Gran Classico Bitter stands alone on ice or with seltzer water, but has amazing range as a modifier for many recipes and spirits. It has offered the cocktailian culture a more complex, non-red alternative Bitter ingredient for the world-famous 'Negroni'. Kina L'Aéro d'Or reflects an 'Alps-Provence' style: White wine made from the Piedmont-grown Cortese grape is infused with Cinchona bark (which produces quinine, the principal bitter taste), Orange Peel, Wormwood and other exotic spices to give a beautiful deep golden hue, an aroma of quince and fine marmalade, with a complex, mildly bitter taste that teases the tongue as its well-balanced sweetness prolongs the finish. Wonderful on its own, chilled, on ice, or mixed with soda or tonic water, for a refreshing, low-alcohol drink. Kina Aéro d'Or is absolutely spectacular in classic cocktails such as the 20th Century, Vesper, or Corpse Reviver #2, and will easily find its way into many more cocktails of your own. This unique and rare liqueur is based on a mid-19th century French recipe and is made only in micro-batches by Swiss distiller Oliver Matter for Tempus Fugit Spirits. The protocol uses the finest French violets, traditionally hand-harvested in the sunny and historic Côte d'Azur, along the Mediterranean Sea, amongst the myriad of precious flowers cultivated in the region for the world's finest perfumes. This elegant elixir has a lower sugar content than the heavier 'crème'-style violet cordials, which more intensely highlights its delicate floral aromatics.